The Makah Tribe is cleaning pockets of its reservation, damaged from historic industrial use, one parcel at a time. Since 2016, the tribe has been restoring a 1-acre site that was developed in 1968, originally intended to be a hake fish processing plant. The site turned into an oil facility used for transferring and storing oil for ships. There were three aboveground tanks on site, including a 300,000-gallon tank, plus plumbing and a pump station. The facility was shut down in the 1980s and the site was identified as a cleanup project in 2005, as part of a reservation-wide Environmental Protection Agency Brownfields Program assessment. The tanks and residual oil were removed in 2016, and groundwater and soil samples were taken in 2017. Surprisingly, the samples showed no contaminants in the water, McMurphy said, and there was minimal contaminated soil around the supply pipe, where a small leak may have occurred. 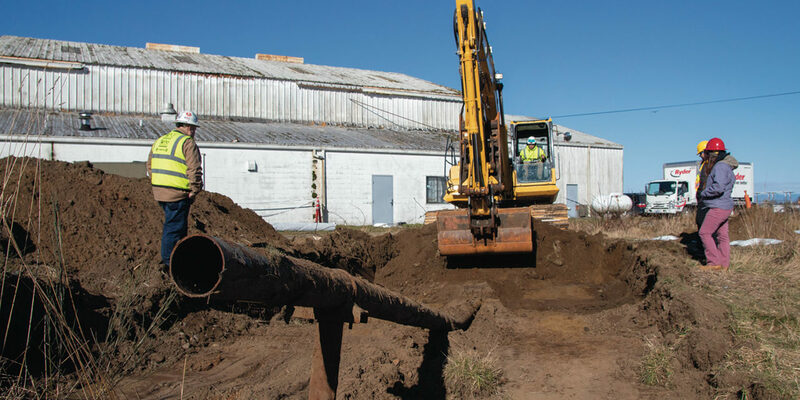 In March 2019, contractors removed the contaminated soils and the pipe. The property belongs to the tribe so it will be up to tribal council to determine the future use of the property after it is restored, said Stephanie Martin, Makah Fisheries habitat manager. The project was funded by federal Environmental Protection Agency.